Luang Ta Chi – Wat Thai Washington, D.C. Please, never doubt that work holds the highest honor In revealing the true value of human life. Luang Ta Chi is the pen name of Phra Maha Surasak Dhammarat, abbot of Wat Thai Washington, D.C. A wat is a place of residence for monastics and a temple of worship. It is also a community center for monastics and laypeople. Luang Ta means Venerable Grandfather. Chi (pronounced Chee) is the first syllable of his monastic name, Chiwanantho. Adults as well as children began calling him Luang Ta Chi affectionately after he began using the pen name in his writings. He will be referred to by his original name, Maha Surasak, when the story of his youth in Thailand is being told. His most familiar name, Luang Ta Chi, will be used whenever he is speaking in his own voice. The following story is an adventure in education, pursued not always under the best of conditions. The Map of Northeast Thailand Luang Ta Chi was born on Tuesday, June 8, 1925, in the year 2467 of the Buddhist era, the year of the ox. As a child he was called Sak, a nickname formed by shortening his real name, Surasak. His fatherûs name was Chan; his motherûs, Mun. Like most villagers, his parents were farmers.They had nine children; Sak was the fourth. The family lived in a Lao village called Ban Phon Ngam, or Village of the Beautiful Termite Hill. 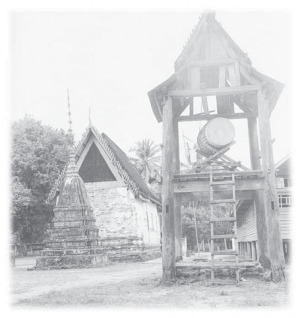 At the time of Sakûs birth, his natal village was part of Mukdahan district in Nakhon Phanom, a province on the Mekong river. The people of Nakhon Phanom were mostly Lao, but a variety of other ethnic groups made their home in the province as well. Luang Ta Chi is deeply inspired by Ajan Buddhadasaûs writings. Despite the fact that many people in modern society work just enough to get by, a tendency that has become the norm, the abbot often emphasizes that we can develop our human potential through our work if we put our hearts and minds fully into what we are doing. In the following poem, Ajan Buddhadasa states explicitly that work itself is essential to spiritual attainment. If enjoyed, too, it makes the heart blossom.Before long, through work, one will understand Dhamma profoundly. Work itself is the very practice of Dhamma.All kinds of work, done as practice, are truly valuable. Just as a sharpshooter can bag a sackful of birds with a single shot, In devotion to work, the worker gains much wisdom. As abbot of the second Thai temple ever to be created in the United States, Luang Ta Chi became known as a skilled preacher, meditation teacher, and prolific writer. His writings include Dhamma novels, short stories, and some poetry. Our Vision is to be used by Buddha to change lives, strengthen temples, and transform the world. We filter every idea, program, and budget request through this vision.